Ok, so this may not be the world's greatest peanut sauce. I mean really, how could anyone actually know that. But it is seriously good. 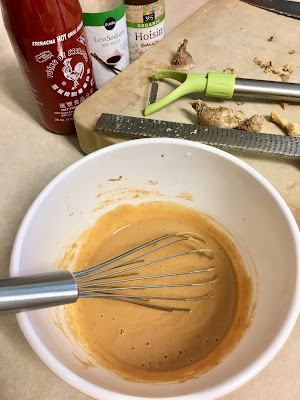 I have never met a peanut sauce I didn't like at Thai or Vietnamese restaurants, or the bottled stuff from the grocery store, or heck even a wrap I got at Starbucks recently had some pretty darn good peanut dipping sauce with it. This sauce is really easy, and I can see myself drizzling on all kinds of things, not just spring rolls. Ahh the spring rolls. 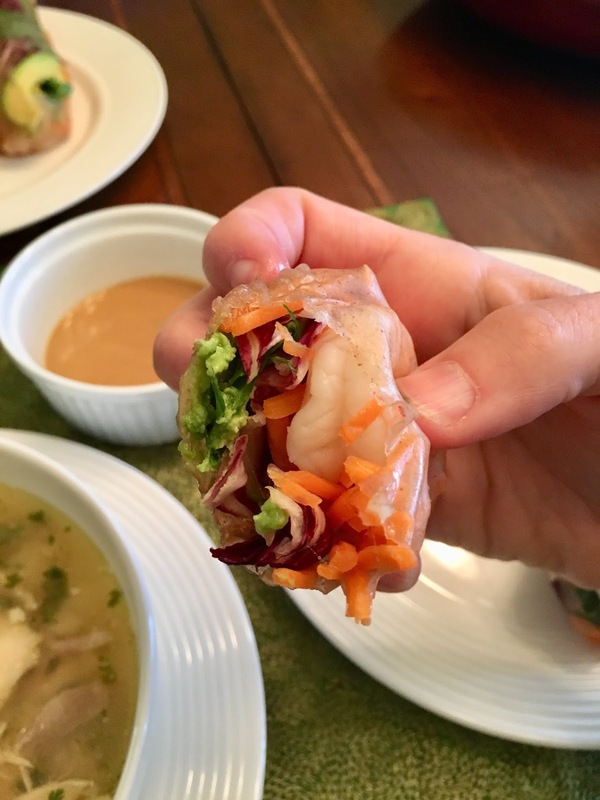 This was my first time making them, and I have a new respect for all spring roll makers out there. My first few, ok like my first half dozen looked pretty bad. Didn't get them tight enough, took too long and the wrapper ripped, but towards the end I got the hang of it and they look much better. They all tasted great, which in the end is what really matters, right? So, I'm sharing my tips and lessons learned here so you can avoid the same mistakes I did if you are in the spring roll making mood. 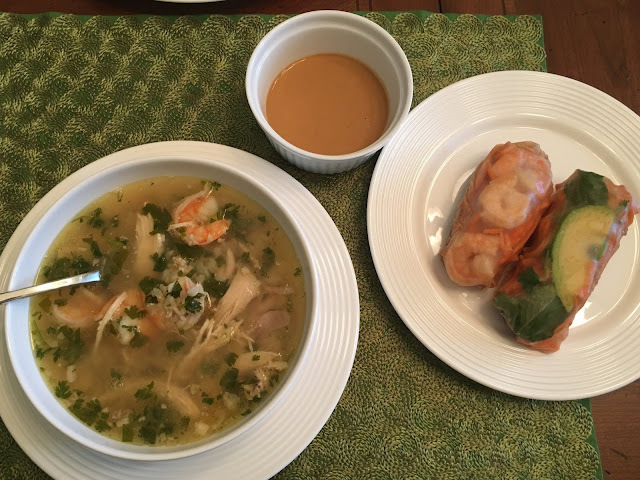 With our meal I also made Cambodian Chicken and Rice soup. We discovered this in a Food and Wine cookbook we bought on clearance 8-9 years ago, and have made it a whole bunch of times since then. I have blogged about it twice actually, so check out this post for pictures, tips, and recipe - Cambodian Chicken and Rice Soup with Shrimp. I'll tell you its company-coming-over worthy for sure. The peanut sauce is very easy. The hardest part is grating some fresh ginger, and that is not hard people. Measure out your ingredients, whisk well in a bowl, and wha-la! Perhaps maybe possibly the world's greatest peanut sauce! For the ginger- don't skimp and use already minced ginger or ginger powder. Get a ginger root from your vegetable section at the grocery store, take the largest part and peel it with a peeler, and grate it in the bowl. I love my various size graters, and find the one in the picture that is flat and long is perfect. Tap tap on the side of the bowl and the grated ginger falls off the back. Tip - in hindsight this bowl below was way too small. Had to be careful when whisking that I didn't slosh the liquids and make a huge mess. Use a nice big bowl so you don't have to worry about that. Also, it may seem like it's too liquidy right after you put the water in. Just keep whisking whisking whisking and in a minute or two it gets thicker to the perfect dipping consistency, just like magic. But, it can't hurt to just add 5 tablespoons and add in the 6th if you feel you need it. Depends on how firm your peanut butter is. Mine is the all natural only ingredient is peanuts kind, which needed the 6th tablespoon. I can get off on a serious tangent on peanut butter, but check your ingredients. Lots of peanut butter out there is barely peanuts at all. It's vegetable oil and sugar and salt, so I highly encourage the kind that is just peanuts! 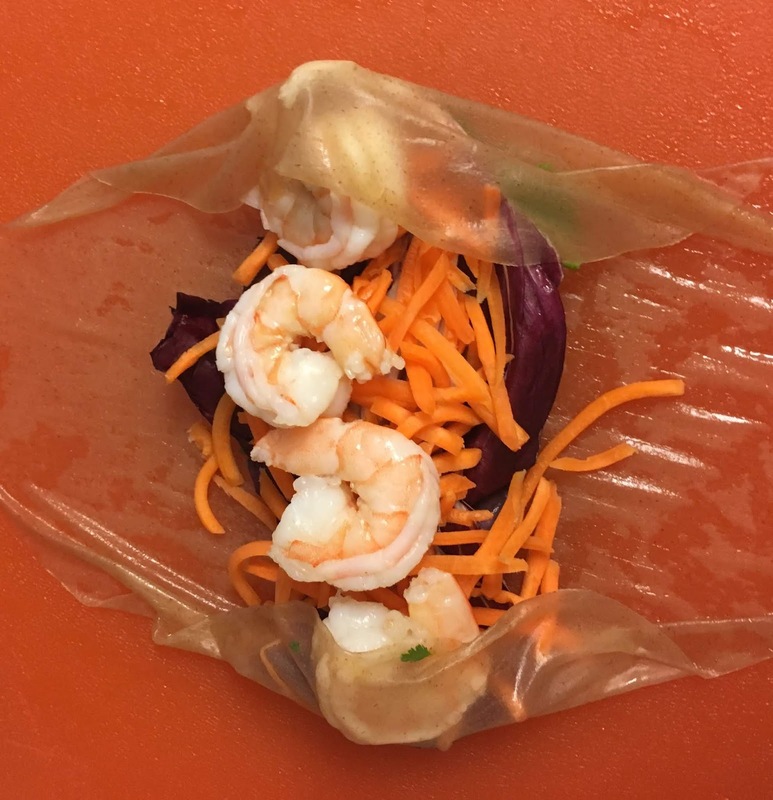 For the spring rolls you'll need some freshly cooked shrimp. To boost the flavor (and save some $$), cook your own, don't just buy some pre-cooked shrimp in the seafood section. 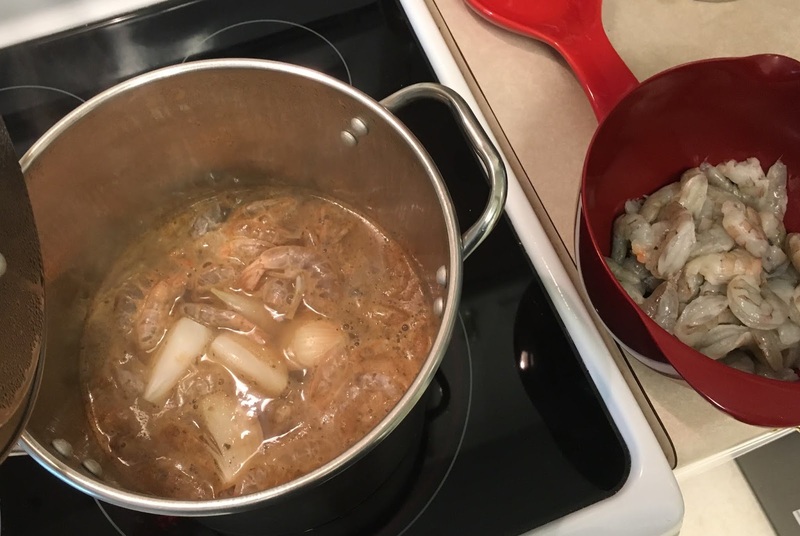 I bought some large shrimp, not jumbo or extra jumbo, and used about a pound and a half for the recipe. 1. Peel shrimp and place peels and tails in a pot with enough water to cover your shrimp and the items below. 2. Add a quartered onion. 3. Add some cajun seasoning of your choice, a good tablespoon. 4. Throw in some whole peppercorns if you have them. 6. Add shrimp, and cook 60-90 seconds. The smaller the shrimp the faster they will cook. 7. Put a larger strainer over a large bowl, and pour contents into strainer (you can dump the quick shrimp stock you just made down the sink but I'd save it, let it cool, and freeze. This has tasty shrimp-y goodness in it!). 8. Run cold water over the contents, and fish out the shrimp. 9. 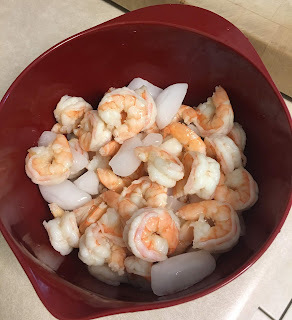 Put in an ice bath to keep from overcooking the shrimp. Now to get to chopping your other ingredients. There isn't much prep when you cheat and by pre-shredded carrots. I didn't see the need to chop or shred anything else. Pull the herbs off the stems, but otherwise I left them whole. For the wrappers - they are rigid, and when dipped in warm water become pliable. VERY pliable. Set up an assembly line. I used a deep dish pie plate and put warm water in it to dip the wrappers. 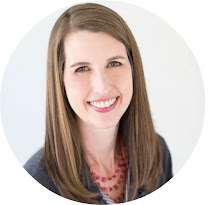 Don't soak them, just dip, get a good coat of water on them, put them on your work surface (I used a cutting board), pile on your stuff, and roll. The wrapper will start our rigid on your work surface, and by the time you have piled your stuff on them and are ready to roll, the wrapper is soft and pliable, and sticky, so move fast. You can't be indecisive in your rolling. 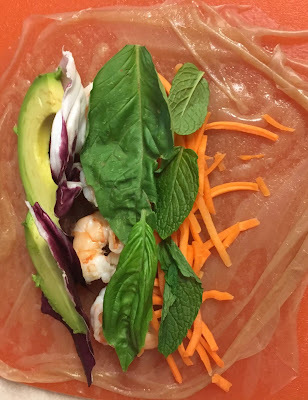 I rolled mine like a burrito - fold over the ends, then start with one side, fold over all the ingredients, tuck tight, then roll. Tips - DO NOT let the wrapper sit in the water too long until it's soft. It will be unworkable by the time you put your ingredients on it. I tore a few of my first ones that way. Had to double up the one below because I had so many tears in the wrapper. Tip 2 - Be decisive in wrapping. If you try and lift up the wrapper to re-do anything you will tear it. Just go with it, whatever you want to undo will only be made worse by trying to undo it. Tip 3 - Don't overload it. I put way to much stuff in my first few. This photo below has too much stuff in one roll. What you put on the bottom is what shows up best through the wrapper. What to show off the shrimp? Put them on the bottom. Highlight the avocado? Put it on the bottom. Below you can see how they look both ways. This recipe is straight from Skinnytaste, with the only change that I used brown rice wrappers. 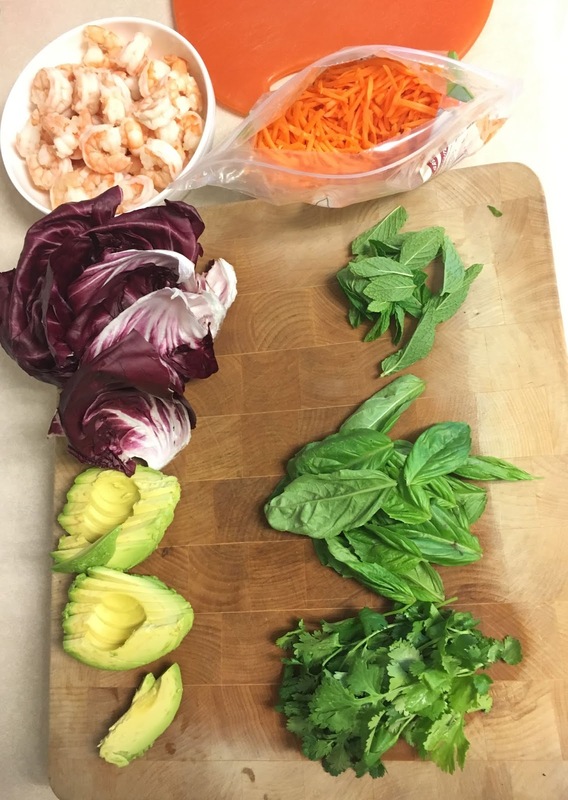 I played it loose with the amount of ingredients I used, I didn't count out my basil or mint or cilantro leaves, just used the amount that looked right in each roll. 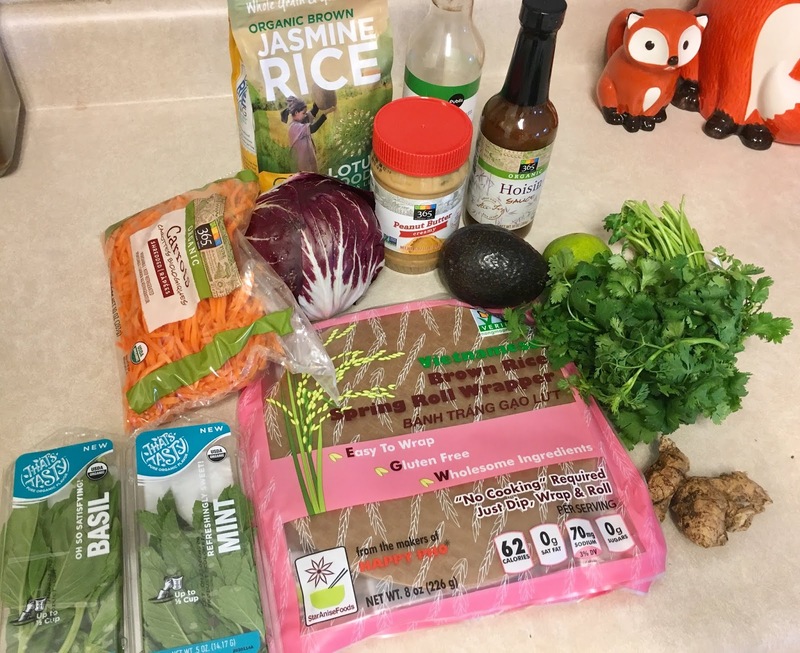 Here is the Original Recipe on the Skinnytaste site.